AUGUSTA — State budget negotiators reached a tentative deal late Thursday to eliminate a 3 percent tax surcharge on wealthy Mainers while funneling an additional $162 million to education, setting up crucial votes Friday just hours before a potential state government shutdown at midnight. And a proposed 1.5 percentage point bump in Maine’s lodging tax means the shutdown threat still looms large given Gov. Paul LePage’s vow to delay a decision on any budget bill that contains tax increases. After weeks of stop-and-start negotiations, members of a special budget committee voted 5-1 Thursday to endorse a two-year, $7.1 billion budget plan. The proposal will go to the House and Senate for consideration late in the morning or early in the afternoon Friday. Legislative leaders will need two-thirds majorities in both chambers to even send it to LePage’s desk – a potentially tall order for a budget containing deep concessions. • Eliminating the controversial 3 percent tax surcharge on earnings over $200,000 that voters approved last November to funnel more money to K-12 education. • Allocating an additional $162 million to public schools, offsetting some of the estimated $320 million that will be lost by repealing the tax surcharge. • Increasing the lodging tax from 9 percent to 10.5 percent. “I think we did the very best that we could do to deliver a budget that people can vote on (Friday), and if it doesn’t get us there, then we will be back at the table,” House Speaker Sara Gideon, D-Freeport, said before the committee voted to support the compromise. The dissenting vote was cast by Rep. Tom Winsor, R-Norway, whose House Republican caucus has been closely aligned with LePage throughout the budget process. The late hour of the compromise, combined with the governor’s vow to take his time with the bill, strongly suggested that Maine could be headed toward its first shutdown since 1991. Back then, thousands of angry state workers filled the State House and Capitol grounds during boisterous protests that created a public relations nightmare during peak tourism season in Maine. While the LePage administration took steps Thursday to mitigate potential impacts on tourists and Mainers – including plans to keep state parks and beaches open – the various parties already were assigning blame for a shutdown and the resulting economic damage. “To not sign a 2/3 budget that will pass over his veto just for the show of shutting down government would be despicable,” Maine Democratic Party chairman Phil Bartlett tweeted. The governor, meanwhile, accused Democrats, labor unions, environmental groups and even Senate Republican leaders of trying to increase taxes. The challenge facing legislative leaders in both parties was evident late Thursday. Budget committee member Sen. Cathy Breen, D-Falmouth, expressed frustration that Senate Democrats “were left out when this final compromise” was negotiated by Gideon and Senate President Mike Thibodeau, R-Winterport. Several Democratic House members in the audience left the room with long faces, and House Republican members have pledged to oppose any tax increases. Thibodeau, a conservative Republican who nonetheless has a frosty relationship with LePage, lamented that “politics in America have changed” and that compromise is harder when people are so passionate about their positions. 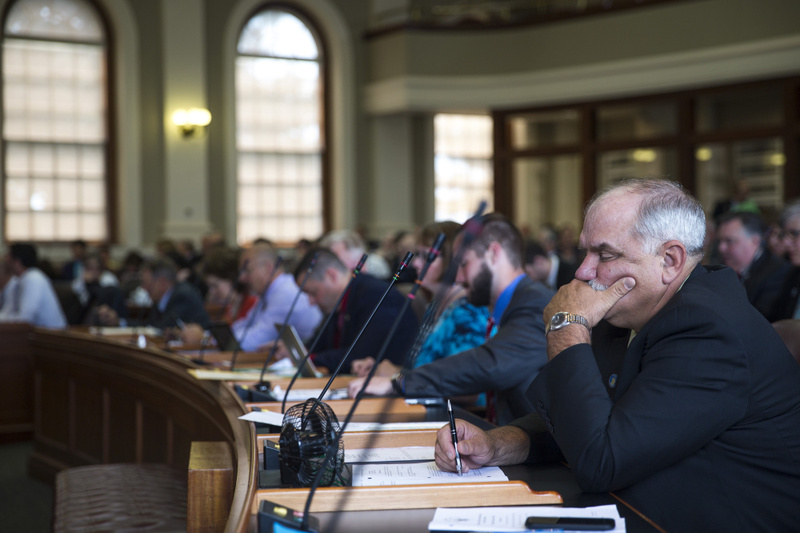 The Legislature voted Thursday morning to extend its session by five days to provide more time for lawmakers to negotiate and vote on a budget and, if necessary, vote on an override of a LePage veto. Meanwhile, thousands of state workers were bracing for the possibility that they will lose pay for an indeterminate period if the budget deal is unable to garner two-thirds support in both chambers, or if LePage holds the bill for up to 10 days. Ramona Welton, president of the Maine State Employees Association SEIU Local 1989 union, said many workers are stressed as they worry about whether they will receive a paycheck in the coming weeks. Many workers also were still waiting to hear whether they would be among the “emergency” personnel who will be required to work during a shutdown, even though they would not get paid until after a state budget is enacted. “There are a lot of questions and not a lot of answers at this point,” Welton said. For months, lawmakers have battled over the 3 percent income tax surcharge on earnings over $200,000. LePage and Republicans have insisted that any budget proposal repeal the surcharge, while Democrats have demanded that lawmakers replace some of the estimated $320 million in revenues the tax was expected to generate for schools. The compromise struck Thursday only gets Democrats halfway there, a point likely to come up in Friday’s debate. Rep. Owen Casas, a Rockport independent serving his first term, is emblematic of the challenge facing leaders Friday. Casas had strong concerns about the impacts of the 3 percent surcharge, but also opposed repealing a tax hike that voters approved via a ballot referendum that he said was very clearly written. Speaking hours before the compromise was unveiled, Casas said he feared Democratic negotiators had gone “too far, too fast” in response to Republican demands to roll back the surcharge. “If you are trying to make it more palatable specifically to House Republicans and the governor, there is a risk you are going to lose a lot of House Democrats and a fiscally conservative independent that didn’t like the 3 percent surtax,” Casas said. LePage’s own two-year budget, unveiled in January, included a 1 percent increase in the lodging tax, and he has repeatedly called for broadening Maine’s sales tax base to capture more dollars from tourists. Yet on Thursday, he threatened to take the full 10 days to veto a budget that increases the lodging tax without cutting the income tax. 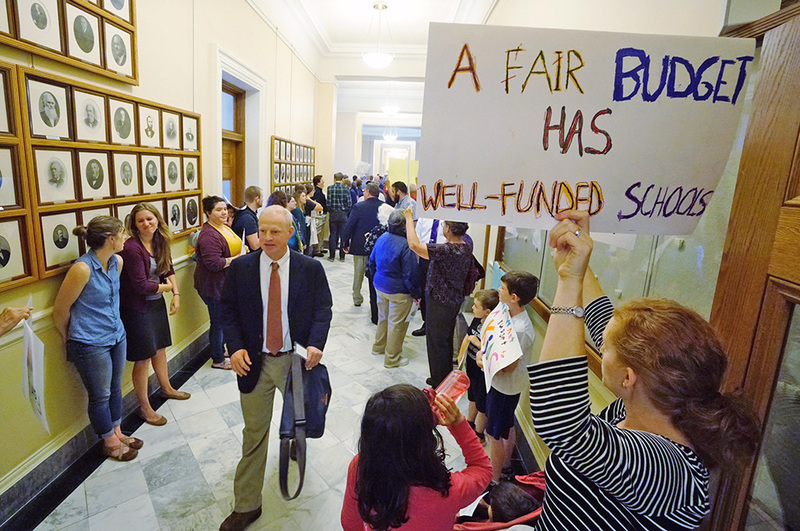 All of the budget proposals currently pending with lawmakers would, in actuality, cut income taxes for wealthy Mainers, but there is disagreement about how to do that while also funneling more money toward K-12 education. LePage’s original budget proposal would have effectively eliminated the 3 percent tax surcharge while also moving Maine toward a flat income tax rate of 5.75 percent by 2020. That proposal has been rejected by lawmakers.